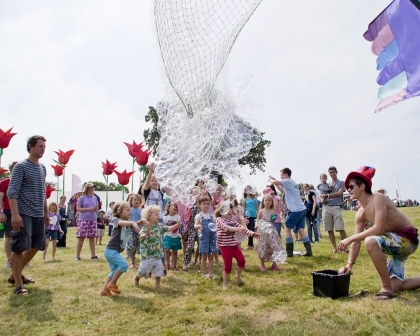 Camp Bestival is a 3-day weekend event especially catering for families since 2008, offering great music, live acts, authors, comedy and more! The campsite opens on the Thursday giving you plenty of time to get settled and organized before the Friday starts. This is perfect for those travelling here from far away and who just want to relax the day before. Although the main event isn’t open on the Thursday, there are food stalls; toilets and the Cosy Camper shop available to ensure you have a stress-free start to your festi-holiday. There is a huge amount of space to camp in so you can get as close to the entrance as you wish or further away if you like quieter evenings and this year they had the option of using a Festaxi! They will drive you and your gear to whichever part of the campsite you wish for £20 from the car park, with space for up to 5 people its easily shared and easier on the back! Should you also struggle to take the long walk back to your tent in the evening they will transport you back to your tent for £5. Campervans, disabled and camping plus have their own designated areas which are clearly sign posted as you arrive. There is also the option of hiring a pre pitched tent, a yurt or even a bus to sleep in- brilliant for those who only do glamping! There are some ‘’posh showers’’ on site should you wish to use them with tea and coffee facilities while you wait although we found boiling water, soap and baby wipes were an alternative option. There are also plenty of toilets around the campsite. Everyone, working or visiting, are extremely friendly and it’s a really relaxing, laid back feel to this festival. It’s not over-crowded and has sign posted meeting points and first aid tents for you to meet up at if anyone of your group gets lost. Every year we’re here we make new friends, re-acquaint with old ones and our 7 year old walks away with new pen pals to keep in touch with. The kids field and activity stalls keep the little ones occupied and the pamper lounge ensures any over-worked parents are relieved of their stresses. This year the weather was particularly hot during the day, though cold at night so be prepared with lots of sunscreen and water. We had to buy an extra blanket one night as it was extra chilly, luckily the Cosy Camper stall just outside the main entrance opens early and closes late so any little extras or essentials you may need are at your door. They also accept card payments so save your cash for the festival itself. Be sure to pick up a programme before hand to keep track of all the acts you wish to see, including the comedy, guests. The Gruffalo was back again this year and still as popular as ever and Mr. Tumble was given the main stage which made a huge difference as he’s such a popular act for parents and children alike. There is only one screen to the right of the stage so those further back and to the left will struggle to see anything on the main stage clearly, especially if the acts are active and move around a lot. The main stage would really benefit from a screen to the left as well to ensure all viewpoints were covered. Highlights for us this year I have to say were Little Dragon (slowly getting more & more popular, so definitely one to look out for), Hot Chip, Mr B The Gentleman Rhymer and the Pigs Big Ballroom which played a range of music including 50s rock n’ roll. The Flora tent let the kids decorate their own cupcakes and the English National Ballet enables those who wish to indulge in a little dance with instructors there to guide them. This year we are hosting the Olympics and the opening ceremony was screened in the big top for anyone who wanted to watch it – which it seemed everyone did as it was packed but had a great atmosphere. Of course, we cant mention highlights without including those closing fireworks on the Sunday night. These never fail to disappoint and had a chorus of oooh’s and aaah’s all round, while Lulworth castle was lit up in animations synchronized to music. There is so much to see and do here at Camp Bestival – its summer camp fun with the festival experience and has something for every taste. Its something we, as a family, look forward to every year as our experience of the quality of the acts, events and atmosphere never falters but seems we discover something new each time. We’d highly recommend it to those with children who want to do something different, those who want an introduction to the big festival vibe and those who just want a fun weekend. “I enjoy Camp Bestival because you can dance and listen to music, and I love camping in the fresh out doors in a nice warm tent. N.B. For any queries about disability access/camping, travel, tickets or general questions, the website has a great FAQ section, alternatively contact them via the contact us section on the website. Review written by Samantha Jones, Alan Thomas, & Evelyn Thomas.